It surprises many to learn the Natural History Museum serves as a wedding venue. But as wedding venues go, it’s certainly one of the most spectacular in London. Founded in 1881, this historic museum receives over 5.4 million visitors a year. With its ornate terra cotta façade, and mouldings representing the past and present diversity of nature, it makes for a stunning venue for both weddings and their photographers. Imagine ascending the grand steps of the Waterhouse Building as a newly married couple, and greeting your guests with canapés, drinks and entertainment. Then, serving dinner in the magnificent surrounds of Hintze Hall, under the watchful eye of their resident Diplodocus. There aren’t many venues which can offer that! If you’re getting married in this iconic venue, you’ll want a photographer to capture its scale and magnificence, along with you and your guests’ unique personalities. Working with a number of expert suppliers, the Natural History Museum dock their venue out like no other. This venue demands a photographer who won’t miss a beat when it comes to detail or lighting. For a London based photographer who truly cares about your wedding photography, head to Iain Gomes. 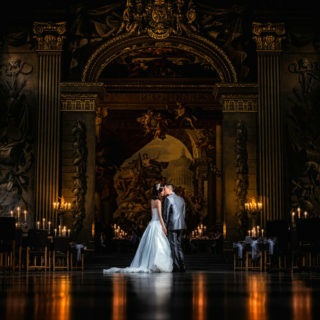 His passion is for creating stories using the medium of photography, and he’s been honoured to be the photographer-of-choice at many top venues in the UK. For more about Iain, take a look here.